The Rycote Windshield Kit #8 is a complete modular microphone windshield system including the Rycote modular suspension mount, windjammer, windshield and necessary extensions. The windshield provides optimum protection against wind and the kit is a useful solution for those who do not already own a suspension mount or windjammer. The Rycote Windshield kits are available in up to 8 different configurations and are identified as systems 1 through 8. Each custom configured system will include the correct combination of suspension mount, windjammer, windshield and extensions (whenever necessary) to accommodate the size requirements for use with your specific microphone. Click here for more information on which accessories best accommodate your microphone. Box Dimensions (LxWxH) 25.0 x 8.5 x 4.4"
Windshield Kit 8 is rated 3.7 out of 5 by 3. 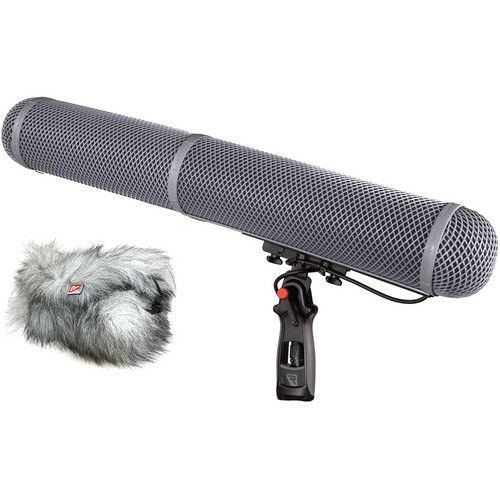 Rated 5 out of 5 by syberfilm from Big bang for the buck I bought this for a shure SM89 shootgun microphone. But was pleased to find out that with the purchase of the number 2 extenison I can also use it with my Neumann kmr 82i and Sennheiser MKH-70. So it is very versatile. The noise is virtually eliminated with this. I use it in the studio with out the fur and outside in windy conditions with it. The shock system is this really reduces the handling noise to next to nothing. One note to new people. It twists on and off. So when it arrives you just twist off the ends and it opens up. Rated 5 out of 5 by Ale31 from Perfect Kit 8 This kit is perfect for Sennheiser 8070. Rated 1 out of 5 by Vinna Prist from It could be way better Yes, it gets the job done. But for just a few extra bucks go with the Sennheiser Blimp System, which has a better quality in all its specs. Waste of money.